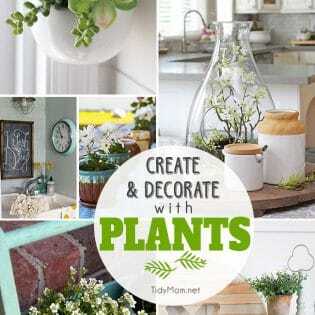 Simple Sustainable Living Tips That You May Not Know! Simple Ways to Sustainable Living: Sustainability is forward thinking. It means looking ahead to making our planet better. What we can do to live green doesn’t need to fit on a to-do list. We just need to be conscious of what we are doing. We can decrease our footprint with little things like; turning off the faucet while we brush our teeth, or flipping the light off when we leave the room. Earth Day is just a few days away, a great reminder to make minor changes that can make a big difference. I think most of us can agree that a clean planet is just as important as clean clothes. 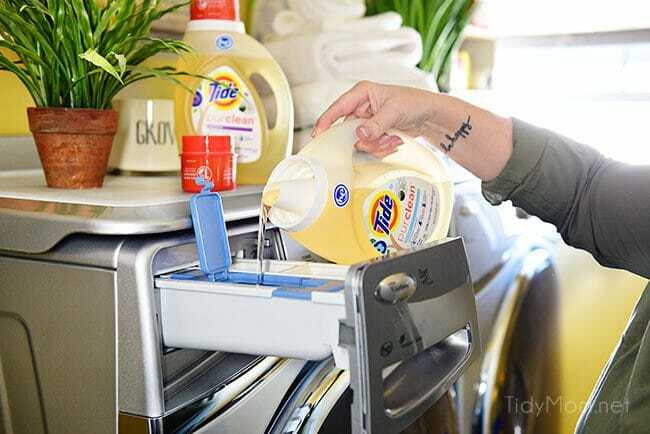 In honor of Earth Day, I’ve partnered with Tide purclean™, who has teamed up with World Wildlife Fund and Kristen Bell to convert as many homes as possible to energy-saving laundry habits by asking Americans to take the Clean Pledge. Simple right? To join, just visit Tide.com/CleanPledge or tweet using #CleanPledge and Tide will make the $5 donation, while you get the credit! Tide purclean and World Wildlife Fund know doing the laundry impacts the environment – yet clean clothes are non-negotiable. 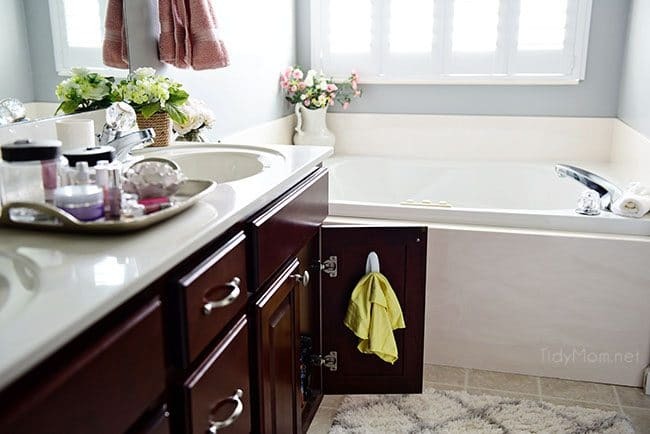 There are, however, small changes that can be made to your laundry habits that make a big difference to the environment – without sacrificing the cleaning results. Getting started on the path to a sustainable living way of life may seem overwhelming if you try to implement them all at once.Remember any effort can help. Don’t worry that you can’t do it all or think you’re not being green enough. With time and patience we can create that life that we actually want to sustain. It’s important to start small. Use cloth for cleaning. We have a few large stacks of old towels we keep in the garage and laundry room. We use them to clean up spills, wipe off the dogs feet, and any many other clean up jobs. When our towels get worn out and I buy new ones, the old ones go in the “rags” pile. Microfiber cloths are great for lint-free cleaning, or you can be frugal and “green” and make cleaning clothes out of old t-shirts. From reusing zip-top bags (yes I will rinse them out and let them dry), or using the same disposable bag over and over when I travel (that quart-sized bag for your liquids at TSA, can be used for years). To making crafts out of an empty popcorn tin, framing prints from an old calendar, making a centerpiece out of empty soda bottles and re-using ribbon on a package. Before you throw anything out, look at it in another light and see if you can use it in some other way. And if you have no use for it, donate it! Wash laundry in cold water instead of hot. Switching to cold water for one year, saves enough energy to charge your phone for a lifetime, power your TV for four months or drive 300 miles!! Also, line-dry when you can. Wearing your outer clothes more than once before tossing them in the hamper is the first step in green laundry habits. Clothing that is next to your body is best to wash after wearing – but second layers and jackets can be worn more than once before throwing them in the washer. Of course we aren’t talking about unmentionables and sweaty workout clothes, but if it doesn’t get dirty, why not wear it twice? By following the manufacturer’s instructions on clothing labels your clothes are likely to last longer. This not only saves you money, but when the average life of clothing is extended, it helps reduce textile waste. 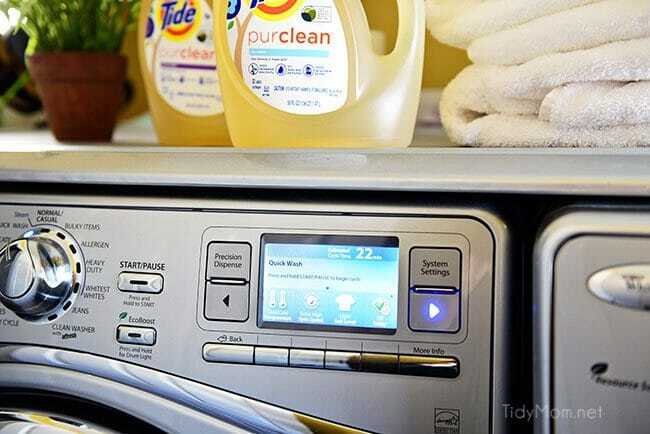 By using a High Efficiency (HE) washer, you will use 3x less water and save 65% energy. Along with doing laundry in cold water (on the quickest setting) and using Tide purclean, you won’t sacrifice clean clothes for helping our planet. 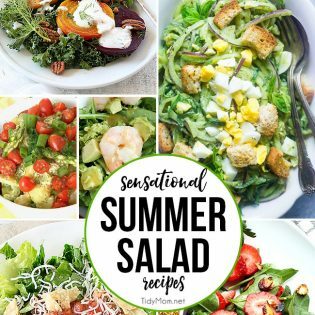 Not only is it fun to watch something you planted grow and show up on your dinner table, you’ll be amazed at the flavor difference of homegrown. 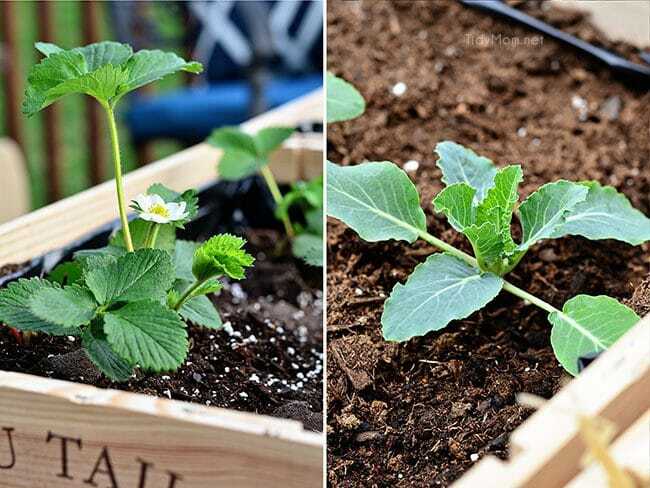 Start small, you can grow in containers on your deck or balcony, a small corner of your yard or even herbs in your kitchen window. Turn off the lights when you leave the room, open the curtains and blinds and rely on the sunlight. Only run the dishwasher when you have a full load. Shut down and turn off your computer completely at night. Unplug items that are not being used. Adjust the thermostat when you are not home. 10. Change your light bulbs. 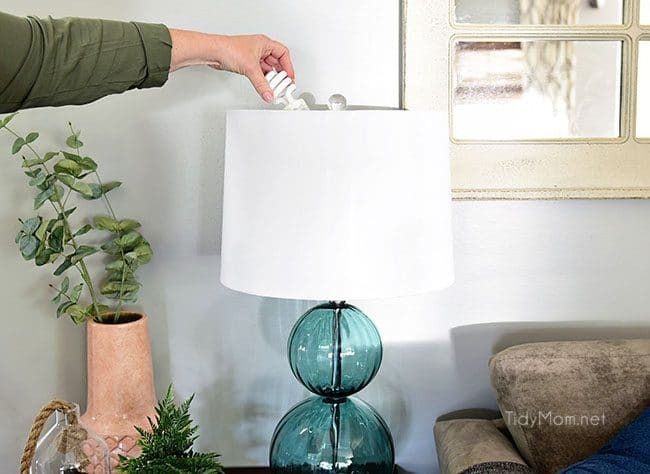 Switch a few of your light bulbs to CFLs , they use about 75 percent less energy and last seven to 10 times longer than regular incandescent bulbs, until eventually you have all of your house switched over. 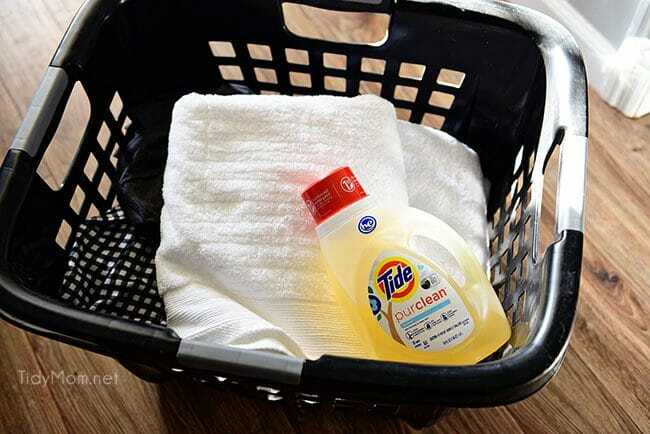 Tide purclean. It’s is made with 65% plant based ingredients and doesn’t sacrifice any of the power cleaning that I count on from Tide, even in cold water. 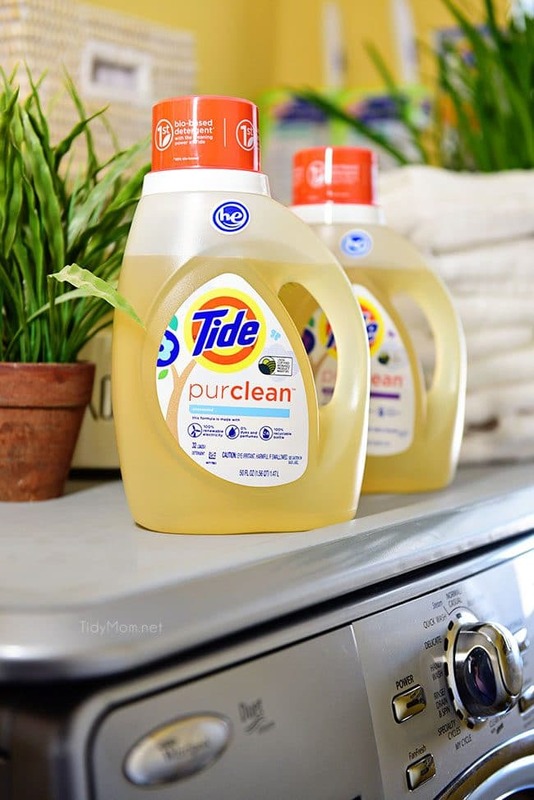 Tide purclean is a formula made with 100% renewable wind power electricity* and is made at a site that has zero manufacturing waste to landfill. It is also formulated to be free of dyes, perfumes, chlorine and phosphates. Even the bottle is 100% recyclable. The same great clean I expect with a friendlier impact to our environment. Love that! Take the challenge today CLICK TO TWEET!! There are SO many more simple things we can all do, I’d love to hear what you can add to the list to sustainable living. Disclaimer: I grew up in a house that used Tide laundry detergent and continue to use it in my own home. This post is sponsored by Tide purclean, as always, all opinions, and my love of Tide are all my own. Thanks for supporting the brands that make TidyMom possible. Every little bit of effort counts. We made some switches, too, even in laundry detergent. I have some terrible habits that I cannot break. One is using paper towels. I use way too many…definitely trying to cut down. I also use too many plastic bags. Trying to get in the habit of using the reusable ones. You know what else is a green product that people don’t think of often? Bar soap. Its packaging is smaller and greener than the plastic containers that liquid soap comes in…just sayin’ Great blog. fun to read! These are fantastic tips to remember. I actually didn’t think washing clothing in cold water was energy saving, it’s a good thing it’s the only way I wash my clothing. We recently stopped using paper towels. We reuse all plastic bags as much as we can too. Unfortunately I live in an apartment in NE Ohio which means we don’t have recycling service and unfortunately we have no recycling plants nearby. I cannot wait to recycle again, it cuts my garbage costs way down. These are all great money-saving tips that people can follow to save money. By making this small changes in your daily life you can save money. Thanks for sharing this.